Hunger Is, a joint charitable program of The Albertsons Companies Foundation, the Vons Foundation and the Entertainment Industry Foundation (EIF), supports Olive Crest Children to make sure students have access to a healthy breakfast every day. 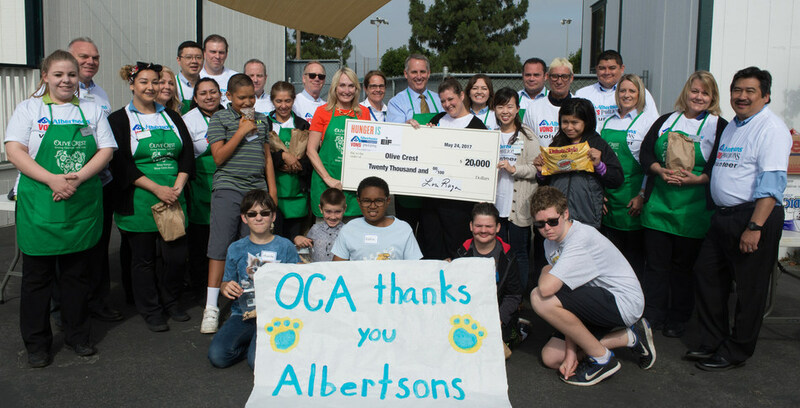 Wednesday, Albertsons, Vons and Pavilions store executives and corporate volunteers helped make healthy snacks with the children at Olive Crest Academy in Orange. The "Hunger Is" campaign is active in the 33 states where Albertsons/Vons/Pavilions has stores. More than 20 volunteers and 175 children participated. At the end of the breakfast time, the company representatives presented a $20,000 check to Olive Crest Academy to continue the program. To date, "Hunger Is" has funded 5 programs in Orange County, totaling $213,000.